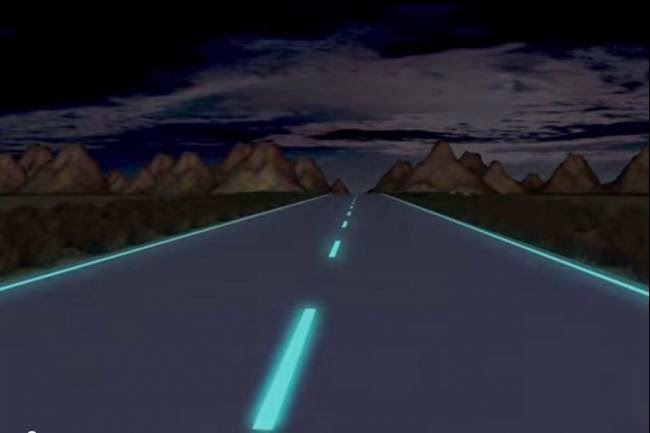 A first glow-in-the-dark 'smart highway' spanning 500 metres has been developed to replace street lights in the Netherlands. It is the first time "glowing lines" technology has been piloted on the road and can be seen on the N329 in Oss, approximately 100km south east of Amsterdam. Designer and innovator Daan Roosegaarde teamed up with Dutch civil engineering firm Heijmans to developed the technology. The glow-in-the-dark markings are made of paint that contains "photo-luminising" powder which charges up in the daytime and slowly releases a green glow at night, 'BBC News' reported. Once the paint has absorbed daylight it can glow for up to eight hours in the dark, doing away with the need for street lights. The innovative technology will be officially launched later this month and if successful could trigger a mass switch-off of lighting across the country's road network, potentially saving the nation millions of Euros. Heijmans said that the glow in the dark technology is "a sustainable alternative to places where no conventional lighting is present". Roosegaarde's past projects have included a dance floor with built-in disco lights powered by dancers' foot movements, and a dress that becomes see-through when the wearer is aroused. In the UK, engineers have developed water-resistant, spray-on coating that makes roads glow in the dark by absorbing UV light during the day and releasing it at night. The coating can adapt to the lighting conditions in its surroundings to glow accordingly.